On the evening of April 8, 2015, The TransAdvocate editors came to a unanimous decision to suspend our signature on the Equality Michigan petition asking for MichFest to change their trans-exclusionary, womyn-born-womyn intention. 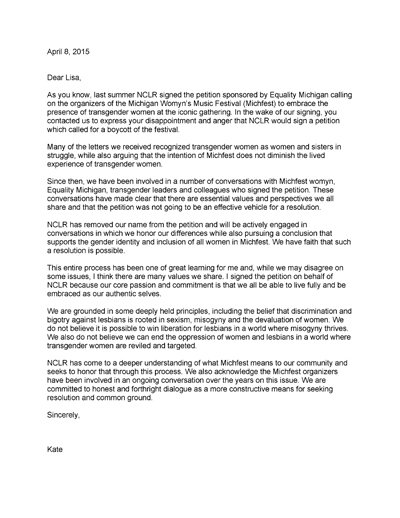 This was decided after earlier in the day the National Center for Lesbian Rights’ (NCLR’s) Kate Kendall sent a letter to Lisa Vogel and withdrew its name from Equality Michigan’s petition asking for MichFest to change its trans-exclusionary, womyn-born-womyn intention. As you know, last summer NCLR signed the petition sponsored by Equality Michigan calling on the organizers of the Michigan Womyn’s Music Festival (Michfest) to embrace the presence of transgender women at the iconic gathering. In the wake of our signing, you contacted us to express your disappointment and anger that NCLR would sign a petition which called for a boycott of the festival. 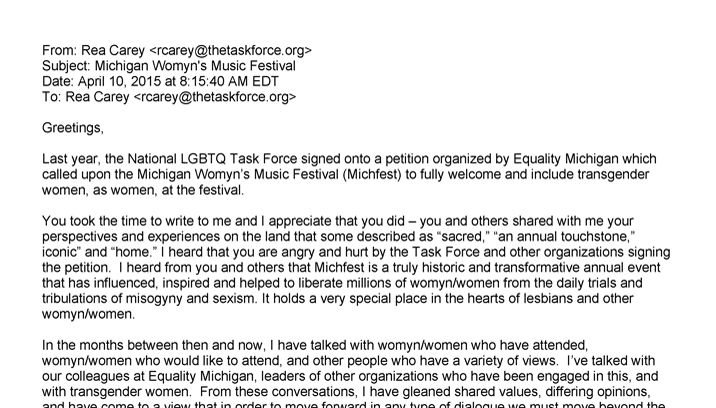 On April 10th, the LGBTQ Task Force followed suit with its own e-letter regarding pulling its signature from the MichFest petition. Last year, the National LGBTQ Task Force signed onto a petition organized by Equality Michigan which called upon the Michigan Womyn’s Music Festival (Michfest) to fully welcome and include transgender women, as women, at the festival. You took the time to write to me and I appreciate that you did – you and others shared with me your perspectives and experiences on the land that some described as “sacred,” “an annual touchstone,” iconic” and “home.” I heard that you are angry and hurt by the Task Force and other organizations signing the petition. I heard from you and others that Michfest is a truly historic and transformative annual event that has influenced, inspired and helped to liberate millions of womyn/women from the daily trials and tribulations of misogyny and sexism. It holds a very special place in the hearts of lesbians and other womyn/women. In the months between then and now, I have talked with womyn/women who have attended, womyn/women who would like to attend, and other people who have a variety of views. I’ve talked with our colleagues at Equality Michigan, leaders of other organizations who have been engaged in this, and with transgender women. From these conversations, I have gleaned shared values, differing opinions, and have come to a view that in order to move forward in any type of dialogue we must move beyond the petition. 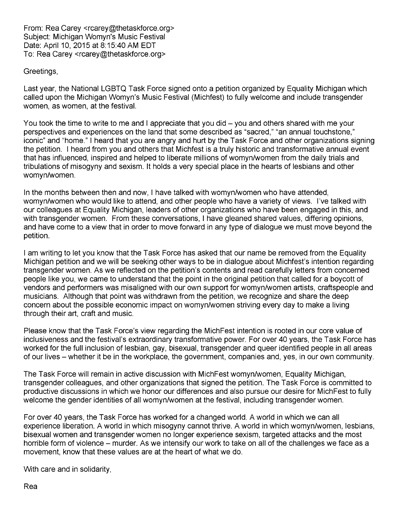 I am writing to let you know that the Task Force has asked that our name be removed from the Equality Michigan petition and we will be seeking other ways to be in dialogue about Michfest’s intention regarding transgender women. As we reflected on the petition’s contents and read carefully letters from concerned people like you, we came to understand that the point in the original petition that called for a boycott of vendors and performers was misaligned with our own support for womyn/women artists, craftspeople and musicians. Although that point was withdrawn from the petition, we recognize and share the deep concern about the possible economic impact on womyn/women striving every day to make a living through their art, craft and music. Please know that the Task Force’s view regarding the MichFest intention is rooted in our core value of inclusiveness and the festival’s extraordinary transformative power. For over 40 years, the Task Force has worked for the full inclusion of lesbian, gay, bisexual, transgender and queer identified people in all areas of our lives – whether it be in the workplace, the government, companies and, yes, in our own community. For over 40 years, the Task Force has worked for a changed world. A world in which we can all experience liberation. A world in which misogyny cannot thrive. A world in which womyn/women, lesbians, bisexual women and transgender women no longer experience sexism, targeted attacks and the most horrible form of violence – murder. As we intensify our work to take on all of the challenges we face as a movement, know that these values are at the heart of what we do. On April 10th, I called Emily Dievendorf, the Executive Director of Equality Michigan, and informed her of our decision to suspend our participation in the petition in an attempt to foster the kind of honest and forthright dialogue that Kate Kendall suggests; we are committed to the truly productive discussions that Rea Carey states are necessary. These kinds of discussions cannot be done with intermediaries alone. In the past weeks, we in the United States saw that direct, honest and forthright dialogue with representatives of Iran brought an agreement with Iran, a country that our nation has had poor relations with since the 1970s. Much of trans community has endured poor relations with MichFest leadership since the 1970s, and it’s time for similar direct honest and forthright dialogue between representatives of trans community and MichFest organizers towards truly productive discussions. We at The TransAdvocate know that this type of dialogue was suggested to the organizers at MichFest last year and the idea was rejected; we have had an intermediary reach out and suggest the same for this year. We have the urgency of now. It would be too easy for Lisa Vogel to say that there is only four months until the next MichFest, so there is insufficient time to work this out before the next MichFest. This is simply untrue. Lisa already acknowledges that trans womyn are womyn. So, it’s just a small step forward to meet with a number of us, and another small step forward to acknowledge that trans womyn who identify as womyn-born-womyn are welcome at MichFest. To paraphrase Alice Paul, our women’s movement — our womyn’s movement — is a sort of mosaic. Each of us puts in one little stone, and then, in the end, you get a great mosaic. Trans women — trans womyn who identify as womyn-born-womyn — are needed at MichFest to bring our stones for the great mosaic. If we can never, by intention, never openly bring our stones, then that mosaic will never truly be complete. We at the TransAdvocate are making a good-faith effort to engage MichFest in dialogue with the goal of a reconciliation that will bring an end to the decades of trauma the MichFest, trans and feminist communities have experienced. So, we at The TransAdvocate are giving pause; we’re giving space. We’re giving space to give an opportunity for the face-to-face meetings that are long overdue to reconcile, heal, and embrace the core value of inclusiveness. We, along with MichFest associated intermediaries who are in dialogue with the TransAdvocate, have reached out to Vogel and await a response.